Some years ago I had the bittersweet pleasure of sitting next to Lena Horne for the Broadway debut of Fences in New York City. Even at 70 plus, her beauty and magnetic smile drew fans, many of whom unknowingly stood on my foot as they fawned over her. 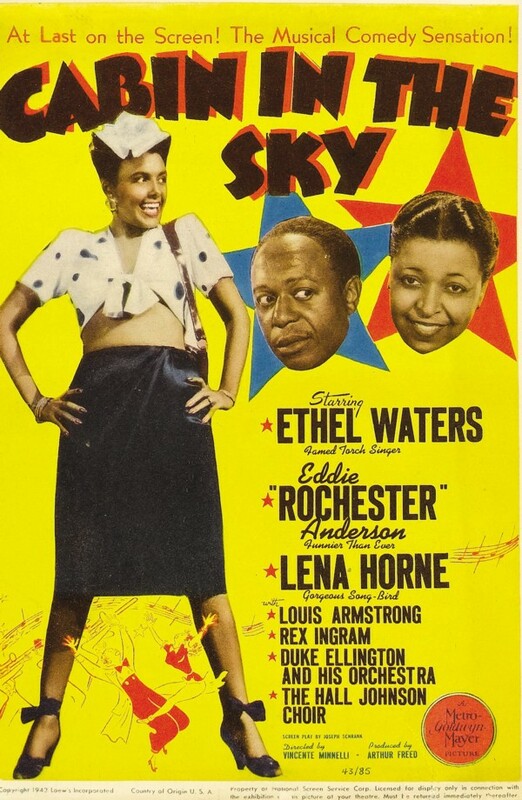 So I can imagine the singed feelings of one Ethel Waters, 47, as she played opposite Horne, then-26, in the overwrought black musical Cabin in the Sky (CITS). Waters is the devout Petunia, whose gambler husband can’t resist the charms of sweet Georgia Brown (Horne). During filming, Horne hurt her foot, and the crew doted on her more than usual. Waters, famously insecure, tried to keep her anger to a simmer. But Horne’s unprecedented seven-year-contract with MGM had to weigh on her mind, especially since Waters, like the rest of the black pack, had to stump for every part she got. As she continues to watch the crew cater to the comely Horne, Waters boils over. After a nasty rant, she finishes the film, but can’t find work in Hollywood for several years. In the Los Angeles Tribune, black columnist Almena Davis writes about visiting the set of Cabin on the MGM lot in October 1942. She arrived as they shot the cabaret scene, where Davis observed the “arrogant Ethel Waters,” “adored Lena Horne,” and “pompous [Eddie] Rochester.” She saw Louie Armstrong and Duke Ellington, who had bit parts, as well. Hollywood stood on the black person’s foot, Davis asserts, and it would take a Herculean effort to force it to budge. Thanks for sharing the human dynamics on still one of my favorite movies. The dance scene in the bar displayed one of the best examples of 1930s and 40s vaudeville hoofers. Cool story, and it makes me want to see the film — I’ve only heard the music. Really interesting back story, the stuff you don’t think about or know about unless someone digs it out. Thanks, Pamela! Thanks for your support, Gay!